IN CHAMPAIGN ALL WE DO IS GREASE ERADICATION! Ability Services Champaign IL is a Certified, Insured, Licensed & Bonded, Kitchen Exhaust System Cleaner. Locally owned and managed by Paul Schneider. As the key person responsible for your restaurant grease & kitchen exhaust system, it’s important to understand that it is very risky proposition to have one Company taking care of your fire suppression systems , fire extinguishers, grease removal and exhaust cleaning. Having separate companies handle exhaust cleaning and fire suppression systems will make sure you have checks and balances so each company can police each other to keep your restaurant , it’s employees, and it’s customers as safe as possible from fire hazards. Our Service – Get a Hood Cleaning Quote Online. For your convenience we offer an online quote system, just let us know a few things and we will provide you with a quote. Currently we are booking two weeks out. We offer a highly skilled team of trained technicians, to make sure your exhaust system as is FIRE SAFE, FUNCTIONAL, and is in compliance with fire codes as humanly possible. Are you in the cleaning business or would like to be? Ability Services offers a complete manual to better prepare you with what you need. National Headquarters Champaign Il. Protect against danger of grease fires with the help of the most experienced Central Illinois Restaurant Hood Cleaning provider. We are rated as one of the top Hood Cleaning companies in the business. We ensure that our customer’s hood systems are cleaned to meet or exceed fire code standards, to remove grease that inhibits system performance and to satisfy Inspector and customer expectations. We have teams of high trained and certified professionals who are always ready to provide all our valued customers with top notch cleaning services. We work in accordance with the local Fire and Health codes and we offer 24/7 scheduling. We are backed by years of knowledge and expertise and have built a strong reputation for reliability and quality with our Central Illinois hood cleaning clients, insurance companies, and local Fire Marshals. The function of a hood is to trap as much smoke, grime, and grease as possible. That is why the hood is placed directly above the cooking surface. 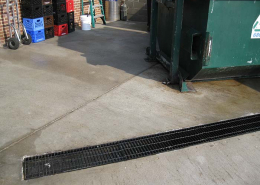 With time, the surfaces of the restaurant hood system will accumulate layers of flammable grease. When exposed to high-temperature air drawn up from the very hot cooking surfaces, this grease can flash ignite, sparking a fire. Grease fires are extremely dangerous because they burn very hot and if not extinguished can spread to the roof and interior of the building and severely endanger life and property. Because of that, it is crucial to take some serious and effective steps to reduce the fire risk. One of the steps is hiring US to clean out the flammable grease accumulations. When the equipment is allowed to build up too much grease, airflow decreases and the fan can become overworked, possibly leading to costly repairs. When the restaurant hood becomes grimier, it will become less effective at trapping smoke, fumes, and grease. The particles that are not trapped by the clogged, inefficient hood system will escape into the air in the restaurant. This is a potential health danger to the restaurant staff and all the people who use the building. In case the local fire or health officials make a surprise visit to the restaurant, they can readily shut down the business or fine the owners if they discover that the restaurant hood is not well maintained and clean. This is one of the worst things to any food service business. Contact us now for the highest quality Champaign Hood Cleaning services. Tired of seeing grease on your roof or being hassled by your landlord over a greasy roof? It's an easy fix and one of our skilled technicians will be happy to give you a free quote. Roof hood vents when properly maintained will help to keep your restaurant safe from grease buildup and fires. Simple regular maintenance could have avoided this situation. We have developed a special proprietary system for deep cleaning stoves, burner tops, ovens, grills, charbroilers, fryers, convection ovens and barbecue pits. Dump-Pads accumulate a lot of grease and become nasty quickly, Grease Patrol can take care of these service areas for you. Every restaurant wants that nice shiny aesthetic appearance. We can help make sure your kitchen passes the eye test. Just ask for a quote as an add-on.